Whither Went The Wallet Photo? OK, that's bob's bs rearing its ugly head. Do you even HAVE any wallet photos any more? I sure don't. I used to, but they became, well, obsolete. What with digital cameras, smartphones, digital frames, Facebook, Flickr, blogs, etc., etc., is there really any need to keep photos in your wallet? 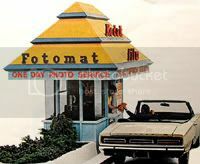 So why, then, are we still subjected to the ubiquitous "wallet photo" size in photo-manipulating software, and options for same at Fotomat?